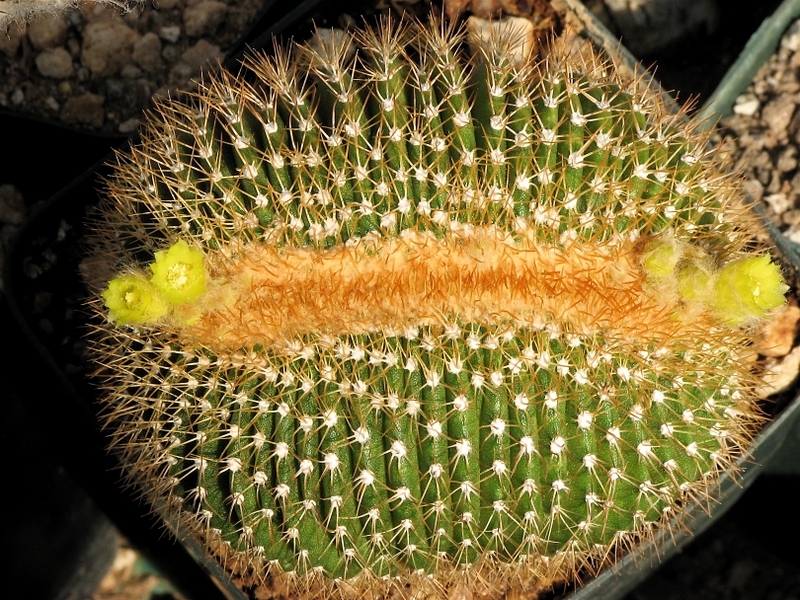 Description: The standard Uebelmannia flavispina is one of the most peculiar and rare cactus famous for its yellow bristly appearance with several ribs and closely-spaced areoles, but this beautiful crested form is extremely rare in cactus collection. The most striking feature is the golden spines it possesses, which serve to protect it from the harsh sun common to its native habitat. More precisely the dense yellow benefit the plant by reducing sun exposure and by trapping a layer of air next to the cactus body. This helps to cool the plant in the summer and keep it warmer in the winter. . Stem: Up to 12 cm in widths very woolly in the apex. Plants in this genus always show woodiness in the lower stem as they age. Central spines: 1 to 4 up to long 1.5 cm. Flowers: Yellow and diurnal in late autumn, or spring. Etymology: The subspecies name flavispina comes from the Latin for "yellow spines". Cultivation: Not easy; it has a large root and lives among rocks. This tropical cactus prefers loves warm, moist, humid conditions, and mist spraying is a must in summer. Water regularly during the growing season and use a very draining mineral potting substrate. At the onset of winter, do not water. Uebelmannias need heat all year round, and extra winter heat; minimum 10°C is best. Avoid any frost. Keep cool in summer. This plant proves to be root prone if kept too cold in winter. To help stop this, a good deep collar of pumice or lava grit is an excellent idea. It prefers a full sun position and possibly afternoon shade in summer. If you can place it so that this occurs, the plant will be much happier. Propagation: By seeds. Germinating seeds can also be tricky. But plants are often grafted making them easier to grow, particularly through the winter. If possible, using a rootstock that is hardier than the Uebelmannia is the ideal.